Home / Blog / Dental Implants / Have you ever been told you can’t have dental implants? My question when faced with such a statement is always “how does your dentist know you don’t have enough bone for dental implants?” And likely as not the answer will be that ‘they had a look and took an xray’. The truth is no one knows how much bone you have in your jaw until they take a CT scan. 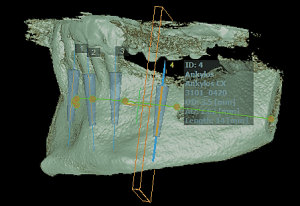 Modern digital dental CT scanners create a 3D model of the jaw which is accurate to within half a millimeter. The model can be looked at from any angle, sliced and diced, examined and measured. If there is bone available it will be immediately apparent. Simply looking in the mouth will give no clue as to the bone available, 2D conventional dental x rays can give only a limited view, so before you decide that you are unsuitable for dental implants, ask for a CT scan. Currently we are offering CT scans free of charge to patients who need a full set of upper or lower implant teeth.